The five year Strategic Plan for the New York State Stem Cell Research Program (NYSTEM) just printed this morning. I'm so proud to have been a small part of this effort. It was a thrill getting to tour some of the NYC labs and to meet the amazing scientists at the cutting edge of this research. We just launched a new campaign micro-site for Nightingale Bamford School in New York City. I was thrilled to hear that the St. Mary's School Mighty Turkey mascot won a Silver / Award of Excellence at the recent CASE District III awards. The athletic mascot and accompanying turkeys for older and younger divisions of this PreK-12 school in Memphis were part of a comprehensive branding and admissions project designed for Cheney and Company. Illustration was done by Laura Tedeschi. See more of the St. Mary's project here. When a logo moves from paper and web to clothing. It's always exciting to see a logo well executed in embroidery. Kudos to the Land Trust for their branding efforts. If you're in Madison keep an eye out for folks showing their Land Trust pride with these great looking jackets. The Middlesex School MX2 Campaign website went live a few days ago. What a fun project bringing to life the beautiful campaign case statement designed by Jeanne Abboud. The campaign is focused on their hopes and dreams for a second century of excellence at Middlesex. Based on the four pillars of Students, Faculty, Campus and Endowment, the campaign website highlights the case for support for these critical areas of importance in the life of the school. Project completed for Cheney & Company. I love the lime green spine on this new little book for the Williams School in New London, CT. Luscious printing on beautiful paper donated by Mohawk. What a treat! And speaking of treats, it's always a pleasure to work with Tom Kates for photography and to have clever insightful copy from Maggie Cohn. Project completed for Cheney & Company. 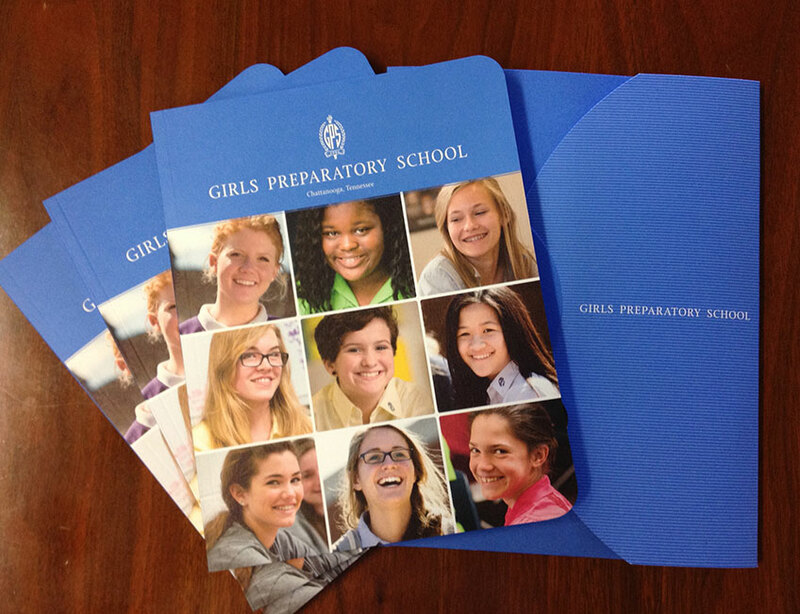 GPS viewbooks and folders arrived this week! Beautiful printing. I'm so happy with how these turned out. It was a real pleasure partnering with Susan Geib (Written Work) for the strategy and copy. Photography is by Billy Howard of Atlanta—a great team! Project completed for Cheney & Company. I was up in Maine at JS McCarthy last week watching printing of the new viewbook for Girls Preparatory School in Chattanooga. Great crew at JSM. All the sheets look beautiful! Project completed for Cheney & Company.